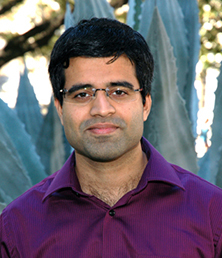 We are excited to welcome our ML Alum, Pradeep Ravikumar as Associate Professor. His research interests are in the area of statistical machine learning broadly. The core problem here has a "comptastical" imperative that combines the statistical imperative of inferring reliable conclusions from limited observations or data, with the computational imperative of doing so with limited computation. His recent research has been on the foundations of such statistical machine learning, with particular emphasis on graphical models, optimization and high-dimensional statistical inference. His thesis has received honorable mentions in the ACM SIGKDD Dissertation award and the CMU School of Computer Science Distinguished Dissertation award. He is a Siebel Scholar, a Sloan Fellow, a recipient of the NSF CAREER Award, and was Program Chair for the International Conference on Artificial Intelligence and Statistics (AISTATS) in 2013. Pradeep Ravikumar received his BTech in Computer Science and Engineering from the Indian Institute of Technology, Bombay, and his PhD in Machine Learning from the School of Computer Science at Carnegie Mellon University. He was then a postdoctoral scholar in the Department of Statistics at the University of California, Berkeley. He was recently an Associate Professor in the Department of Computer Science at the University of Texas at Austin.